Rubberexpansionjoint.com ST Style molded rubber expansion joints are designed with a metal reinforcing collar molded into the necks of the carcass. This allows the ST style to use light weight split retaining rings (sold separately) to back-up the molded integral rubber flange that is molded into the ST. The ST style is also available in a filled arch design know as style STF. The ST can be made custom with multiple arches to improve movement, non standard flanges or enlarge flange type (different size flanges on each end), non standard lengths, as a reducer type, or with permanent offsets built into the joint. Larger sizes are available on request. The ST and STF are available on request to meet the requirements of the U.S.C.G. The STF style or filled arch will reduce allowable movements by 50%. It will also increase spring rates by 4 times that of the ST style. The filled arch design is a great option to reduce turbulence and eliminates the ability of solids to settle and remain in the arch. 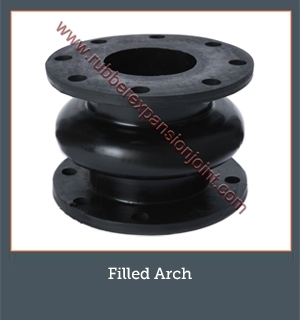 The “filler” in the filled arch is made from a low durometer soft rubber material that is bonded to the ID of the traditional arch. The ID of the STF has a one piece seamless inner tube eliminating the ability of the filler to come loose in service. Carbon Steel Zinc Plated Part No. 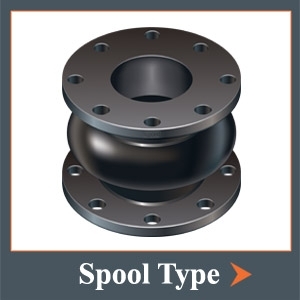 We carry the largest online inventory of rubber expansion joints with the most competitive prices online. There is no middleman-you are buying direct from the manufacturer. We offer a 30 day return policy. No order is too big or too small. Contact us today!